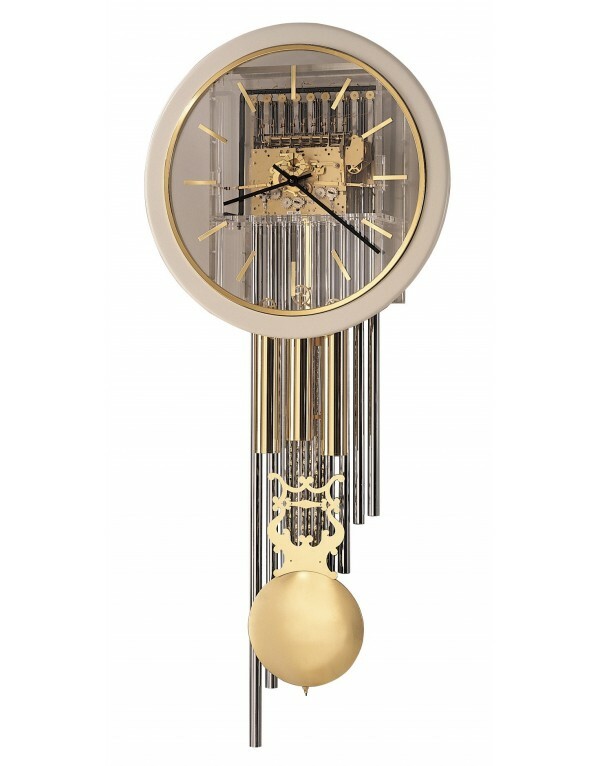 This magnificent 65" tall wall clock features a visible movement made from solid brass. "¼" thick clear acrylic dial has separate second-hand track, black hands, and polished-brass hour markers. Polished-brass bezel and a 26" diameter off-white ring accent the dial. Polished-brass weights and pendulum are complemented by nine chrome-plated chime tubes. Kieninger cable-driven, triple-melody, nine-tubular chime movement features 36 brushings (24 bronze and 12 jeweled) and plays choice of Westminster, St. Michael, or Whittington ¼, ½, and ¾ chimes accordingly with full chime and strike on the hour.